Mr Nesbitt, who was first elected to the Stormont Assembly last year and is only three years in the party, easily defeated his sole opponent, John McCallister, by 536 to 129 votes. Mr Nesbitt takes over from Fermanagh man Tom Elliott, who last month announced that he was standing down after just 18 months in the post. His election makes it clear that the UUP will continue to support the current political arrangement in the North for the foreseeable future. He has ruled out the formation of an opposition at Stormont, preferring his party to remain within the ‘shared out’ Six-County Executive. His greatest challenge will be to revive the party’s political fortunes after it was badly squeezed in recent elections between the more moderate unionist Alliance Party and the more hardline DUP. In a significant move, Nesbitt is to request permission to speak at Sinn Fein’s Ard Fheis [annual conference] next month, with a view to encouraging nationalist voters to support his party. “There has never been a better time to promote the cultural and economic benefits of remaining as part of the United Kingdom,” he said. Both of the two main unionist parties in the North have claimed that there has been a shift within the nationalist community away from the traditional goal of a united Ireland, and that they are winning increased support from former nationalists. The former TV celebrity said he wanted to attend the conferences of all the main Irish parties including Fianna Fail, Fine Gael and the Labour Party in order to promote unionism to a new audience. In recent years, Sinn Fein has placed its focus on “building bridges” and reaching out to unionists, rather than advance a political agenda for reunification. The smaller nationalist SDLP has also moderated its stance, while the parties in the 26 Counties have broadly abandoned the issue. Last week, Taoiseach Enda Kenny created a controversy when he told an audience of students and academics in China that he saw no timescale for the unification of Ireland. 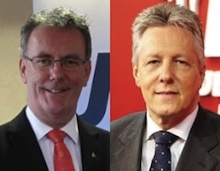 Meanwhile, DUP leader Peter Robinson has said he would like more Catholics to join his party. Mr Robinson was delivering the inaugural ‘Edward Carson Lecture’ at Iveagh House, Dublin, to commemorate the centenary of a decade of momentous events in Irish history. The lecture is named after a former leader of the UUP who organised the first loyalist militia in the North. In the course of an hour-long speech, Robinson referred to the positive environment that now prevailed for unionism. He said there were many Catholics who felt more comfortable with the policies of the DUP than those of Sinn Féin or the SDLP. He said the new political dispensation in the North allowed more Catholics to join the DUP. “That is not to say that they will feel comfortable calling themselves British or even defining themselves as unionists, but they see their best future as part of Northern Ireland, within its present constitutional context as part of the United Kingdom. Last week, former UUP leader David Trimble claimed that the nationalist vote in the north is “declining significantly”. Now a Conservative ‘Lord’ in the British parliament, he told a unionist rally in Troon, Scotland that the argument for the union had “been won” in the north of Ireland and the same could happen in Scotland. “We have a situation just across the water from here where the argument has been won and the number of voters supporting nationalism is declining significantly,” he said. He said the north of Ireland had “come out of a huge campaign that was intended to break the union”. But he said that had failed because of the efforts of the police and the armed forces but also because “we won the political argument”.